The Emperor (IV) — fourth card of the Major Arcana — signifies patriarchy, material power and protection. While generally considered to be a neutral card, when it appears in a reading this is typically a good omen, indicating that a significant power shift is imminent. This realignment of power and influence could manifest as a promotion into an important new leadership position at work, or conversely, you may find that a new boss or authority figure has come into your life — for better or worse. In this context the Emperor has the potential of being a bad omen, as this change may dramatically reduce your influence, prestige and authority in the material world. 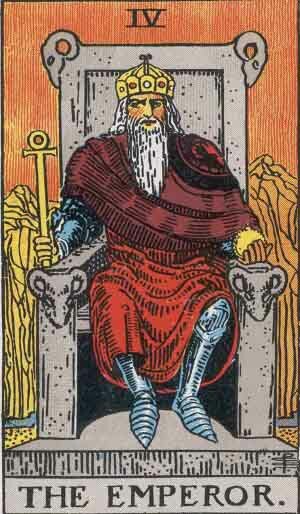 In the Rider-Waite deck he is presented as an older man with white hair and a white beard, elements that signify his experience and wisdom. The golden crown he wears, the ankh scepter in his right hand and the globe in his left hand point to his material wealth and power. He is covered in a flowing red robe that stops at the knees and elbows to reveal the armor he wears underneath. Seated and looking straight ahead, his arms rest on an imposing stone throne that rises above his head. Adorned on all four corners with ram’s heads, this throne sits on a mountaintop while the peaks of other mountains are visible just behind him. These mountains are bare, like the air behind and above him. As a person the Emperor denotes someone who is as ambitious as they are competitive when it comes to their day-to-day interactions with the world. Typically an alpha-male who exudes confidence and authority, people represented by the Emperor are by nature honest yet confrontational, ready to fight as hard as they need to in order to take control over a given situation. Solid and stable but with a stubbornness that can almost be offensive, particularly when it comes to political issues, the Emperor makes for a tough, very demanding boss. He is often an older, wealthy, father-figure type who possesses a strong business acumen and has no time for fun or any other activity that he alone has deemed to be frivolous. 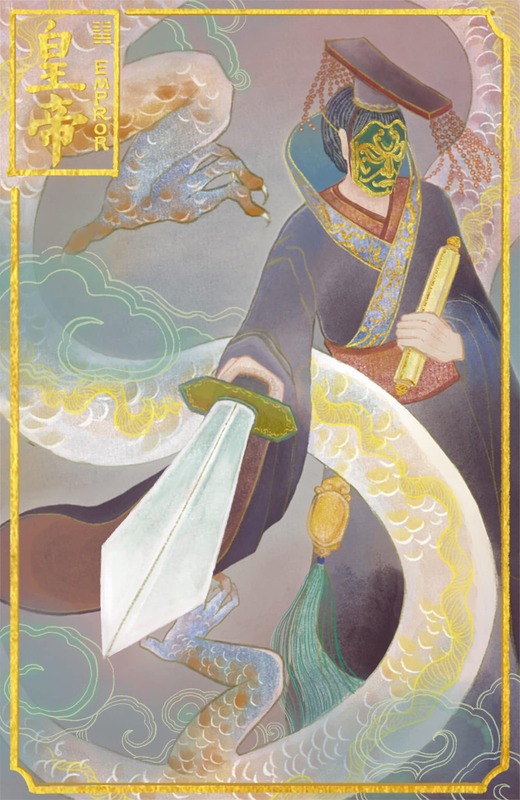 When it appears in a spread as a positive influence, the Emperor represents winning and great success, likely guided or at least encouraged by a powerful male figure who has your best interests at heart. However, the opposite is true if it appears as a negative: you will find yourself engaged in a power struggle with a very strong and resolute masculine figure who rarely emerges as the loser in a conflict. In such cases, the Emperor indicates that you are in line for a major change, and that you are destined to take on more intense and greater responsibilities than you’ve ever experienced before. Authority is one of the principal concepts behind this card, regardless of it being attributed to you directly or to somebody who is currently playing, or will soon be playing, a major role in your life. The Emperor is a very welcome sign if you are entering into a new relationship. As a woman it indicates that this person is stable, secure, and somebody you could comfortably settle down with should marriage be a personal goal. If you’re already in a relationship, finding the Emperor in a love reading suggests that you’re working harmoniously together to build a small fortune, and that you will enjoy a very comfortable retirement together. If you’re single, the card denotes that you will soon meet somebody who is as keen as you are to enter into a committed relationship. In a career reading, the Emperor tarot card indicates that all your hard work is about to pay off. This could be in the form of a promotion or pay raise, but could also arrive as a major new client or business opportunity. Generally speaking, it represents self-employment or high-level leadership positions. Your financial future promises to be stable, so if you’ve been pursuing any major opportunities or need to make an important money-related decision, this is an excellent time to take action. Nevertheless, you need to be a little more responsible with the money that you do have. Start paying closer attention to your spending habits and see if you’ve been a little too cavalier with your finances. Stop always worrying about your health — it’s unhealthy. Besides, even if you have been experiencing health issues lately, the Emperor is saying that you will be fine. Stick to traditional doctors at this time and avoid anything offering “wellness” or which differs from the medical approach you’ve always followed. When reversed, the Emperor card denotes an authority figure who is abusing their power over you, leaving you feeling resentful and with a strong urge to rebel. However, open rebellion is not the approach to take and will only work against you in the end. Rather, you need to remain calm and composed. Logic will be your best method of self-defense when confronted with this person, as their domineering behavior is rooted in an otherwise uncharacteristic childishness, and their demands upon you often irrational. Should you be in a relationship, the Emperor reversed in a love reading signifies that one partner, most likely the male in heterosexual couples, has created an imbalance of power that is leading the other to feel trapped and unhappy. A spirit of compromise needs to be reintroduced into your partnership or you will soon be going your separate ways. If you happen to be single, this isn’t the time to seriously consider entering into a hopefully long-term relationship. A worthy male will make themselves known to you soon enough, but for the time being you’ll be better off pursuing casual encounters rather than hope for more permanent suitors to come into your life. In a career context, the Emperor reversed indicates that the high pressure job you’ve dutifully been performing for all these years is no longer bringing you satisfaction, and it’s time to consider moving on. This could be to another job in your chosen field or a new career path entirely. While your dissatisfaction with your present employment could be the result of an incompetent, domineering boss who lacks empathy and affords you little respect when you’re the person who actually holds the entire operation together, it’s also entirely possible that this is not the career path you were destined to pursue. Finding the reversed Emperor in a money reading is never a good omen, as it suggests that you are lacking control over your finances. This doesn’t necessarily mean you’ve been irresponsible with your money, it could just as easily be the result of having a low-paying job that doesn’t provide you with enough to meet your expenses. Regardless, it’s a good idea to seek outside assistance. See if an accountant or financially astute friend or family member can help straighten out your expenses. If you haven’t been taking good care of your health lately, then it’s time to start. If you don’t, expect to be faced with the consequences of your actions, which could prove to be very serious sooner than you think. On the opposite end of the spectrum, assuming you haven’t started experiencing any particularly negative health issues, it’s possible that you’re been putting too much emphasis on your health and are worrying needlessly as a result. You could be pushing yourself too hard in the gym or when engaging in your various workout routines, to the point where it could result in injury. In the past position, the Emperor indicates that you’ve benefited greatly from the nurturing your father or an important male teacher provided you as a child. You continue to be guided by the lessons and values this individual wisely imparted to you. In the present position, it means that there’s a good chance you’re about to be introduced to a celebrity or famous person who was one of your childhood heroes. At the same time, there is an individual in your life who is introducing you to a new way of being, a more positive approach that this person, likely an older, powerful male, personifies. In the future position the Emperor tarot card indicates that you are developing a new, more conservative mindset that will eventually have an impact on your political leanings, which in turn could negatively affect several of your personal relationships. A powerful male figure will be the impetus behind your apparent political awakening. However, this person is not to be trusted and will prove to be a negative force whose teachings only bring you, along with the people who love you, harm. Regardless of its position, the Emperor represents authority, power and masculine energy. The implication here is that marriage to a powerful man is literally in the cards. Upward social mobility is indicated by this combination. Diplomacy is the order of the day and a wise approach to take with any immediate conflict that you, or someone close to you, might be facing. This combination signifies a large charity organization, trust, or foundation. A substantial donation to or from one of these bodies is imminent. A the counterpart to the Empress, the Emperor stands for all things fatherly. He brings structure, order, and authority to your life. While moving forward in your endeavors, this card indicates that assertiveness and rationality will take you a long way. With that said, your answer is yes.